The only accident is her being born. Romson sparked debate after she spoke on public broadcaster SVT’s breakfast show ‘Gomorron Sverige’ on Tuesday morning, while discussing housing minister Mehmet Kaplan’s resignation. She praised her Green Party colleague’s efforts working with Muslim youth associations in Sweden, including his former role leading the non-politically affiliated group Sweden’s Young Muslims. “He has been chairman of Young Muslims in tough situations like the September 11th accidents,” she said. Her words were quickly criticized by viewers, who pointed out that nearly 3,000 people died in the al-Qaida led 2001 attacks on New York’s World Trade Center, Washington’s Pentagon building and United Airlines Flight 93. 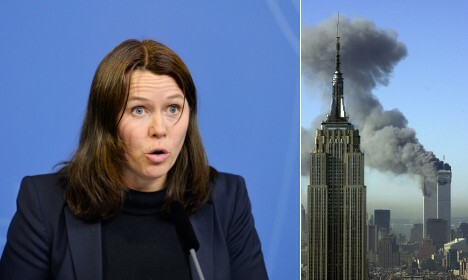 “Did Romson just call 9/11 ‘the September 11th accidents’ on SVT?? In that case, talk about reducing [the significance] of one of the world’s biggest terror attacks,” wrote defence expert Johanne Hildebrandt on Twitter.